As so many others have, I’ve been mourning the death of Mary Oliver this past week. I have re-read many of her poems, discovered new ones, and re-listened to her On Being interview. I have felt simultaneously comforted and bereft. Oh, what a voice we have lost. Then, when browsing through some past posts, I rediscovered this one from the Thursday after the election. Yeah. That election. It features my then college-aged daughter seeking comfort in Mary Oliver, trying to spread love, and netting some Emily Dickinson. Re-reading it moved me once again to tears and reminded me how much our world has changed in the past few years. Sigh. While Mary Oliver’s words live on and continue to offer a path through the crazy, her death adds to my growing feeling of overwhelming loss and unease. I feel like there’s an insidious malignancy gaining ground and I’ve just lost a critical and powerful ally. So I turn again and again to poetry, to nature, and often to her words for comfort. Again and again. This week’s Poetry Friday Round up is hosted by Tara Smith at her blog Going to Walden. When I read the poem she shared today, a powerful and disturbing Linda Pastan poem, I was struck by how it resonated with the linked post I was sharing and with my own feelings. This entry was posted in Poetry and tagged emily dickinson, Mary Oliver. Thanks, Irene. What a gift Mary Oliver’s poetry is to all of us! Every day I think both thoughts: I need to hear the news and I need to turn off the news. Comfort is found here and in other PF posts. We are all in this together and we need to keep spreading hope and peace. Our collective lives depend on it. I’m constantly torn between listening and tuning out. I retreat to preserve some calm/sanity, but then feel guilty for not listening/responding/acting. You’re right about finding comfort in the PF community. Your post from the Thursday after the election brought a tear to my eye. We are in uncharted waters, and it is a challenge to steady ourselves and each other. I don’t feel like we’ve really lost Mary Oliver as an ally, though. Her power is still present, isn’t it? I’m so glad you checked out the link, Tabatha. I also found that post so moving again when I read it. I agree that Mary Oliver’s power is still present, but while I still find comfort in her work (and so much more), it does feel like a light went out in our world. We are on the same page, poetically and in terms of our moods, aren’t we. Still, we are gifted with these beautiful poems and the world, somehow, feels a bit right when we can draw comfort from them. Inspiring, thoughtful piece. I don’t know your kids, but they seem grounded and awesome! Mary Oliver lives on in all of us. What we think about, we bring about. We must remain hopeful. I try to remember that, Dan, and to spread hope and kindness in my corner of the world. Some days that’s harder than others–at least the hope part. Speaking of hope–I hope you and Hannah are enjoying some California sun and respite from the cold. I find myself “escaping” with and through Mary Oliver, too, Molly. You and I, and Mary, are kindred spirits in that we seek solace from the world, from the every day, in nature. Being in it, thinking about it, writing about it has always brought me comfort and will certainly continue to do so. Thank you for sharing your reflection. Thank goodness for Nature! It’s been a bit tough to get out lately with the frigid temps, but even then I’m endlessly fascinated by the ice formations and the vocal ice-shifting river. Working to embrace the wonders to temper the woes! Taking the time to absorb and appreciate our natural world gives us breath for the crazy around us. It would be nice, though, if there were just a touch less crazy. Thanks for checking that out, Ruth. I found it so interesting to go back and to realize that I’m still reeling, two years later. Both your poem and the one Tara shared, though written some time ago, are so very relevant. The best poetry is timeless. It can make us think, move us, enrage us, comfort us- no matter the time. Thank you for sharing your tribute. Good point. Mary Oliver’s poetry certainly transcends her death. I hear you. It feels like we’re on a slow-motion train wreck. There are times when the most important thing seems to be to bear witness to the awfulness, and then when I take solace in the small joys (the goodness of strangers, the poetry of Mary Oliver, my own little garden) it feels like I’m a traitor to reality. Well, so be it. We also need to witness every GOODness so that we can maybe maybe maybe turn the train before it’s too late. Mary Lee, it sounds like you have achieved a healthy balance. Here’s to tuning in to the GOODness that so clearly exists in our world! Thanks for this, Molly–it was a painful thing to go back two years, and it is indeed a serious thing to be alive. Believe us, say the birds. Makes me want to be resolutely, ridiculously, gravely alive every day, just to give ’em hell. Your comment made me smile. I love the idea of being “resolutely, ridiculously, gravely alive every day!” You, go! There is much of these times that are troubling, but I am thankful for the words of wisdom and comfort shared by Mary Oliver and other poets and this community. We will get through it together because people are realizing that together we can make a difference. Hopefully the rest will wake up from the nightmare they are living in and sharing with us. This community gives me hope that there are many, many good people working to make a positive difference. Mary Oliver reminds me that celebrating nature and life is always worth doing. It’s hard to know what to do, isn’t it? Those fresh mornings keep coming though, and I suppose it’s something to recognize the beauty in life daily and to keep on holding out against the madness. At least I know I’m in good company! Yes, “It is a serious thing just to be alive” and to notice nature and put aside the harass of each political mayhem-like day. 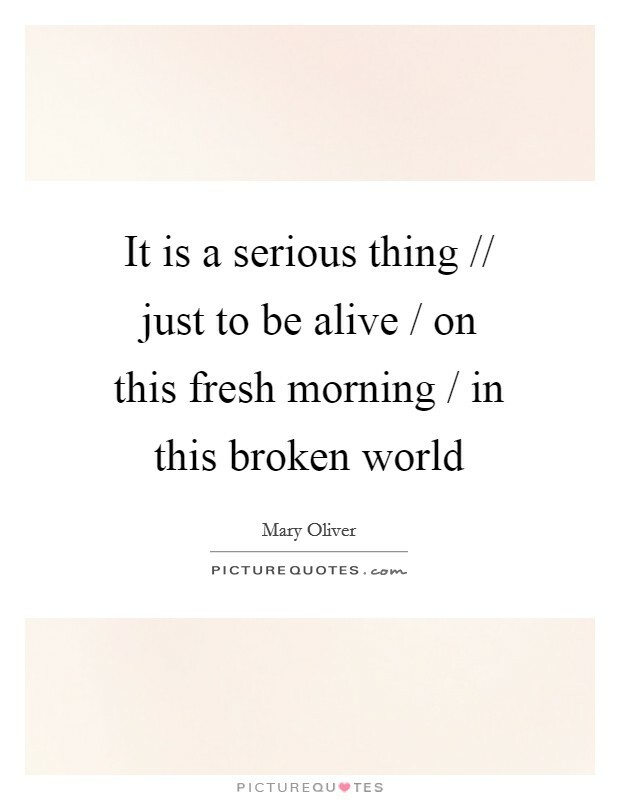 Thanks for sharing more of Mary Oliver Molly.